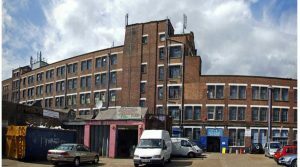 London Fire Brigade received a call to a fire at the Bussey Building in Peckham at 01:46am on the morning of Wednesday 19th July. The “accidental” fire had started in an artist’s studio on the fourth floor. Four people evacuated the block when its alarm and sprinkler system became live. When the Fire Service arrived, 4 sprinklers heads had operated in the room of origin along with a head in the corridor outside the unit. These had controlled the fire until it was extinguished fully by the Brigade. There were no reported in juries. From press photographs of the building it is evident that without the operation of the sprinklers this could have been a protracted and dangerous incident for all concerned. “This incident highlights the clear benefits of sprinklers to businesses and we would urge all companies and business owners to install them. “In this case the sprinklers successfully contained the fire until crews arrived. Fire crews from Peckham, New Cross, Old Kent Road, Greenwich, Deptford and Brixton fire stations attended. Read more in the Southwark News or at London Fire Brigade Website. This entry was posted on Monday, July 31st, 2017 at 3:13 pm and is filed under All Posts. You can follow any responses to this entry through the RSS 2.0 feed. Both comments and pings are currently closed.